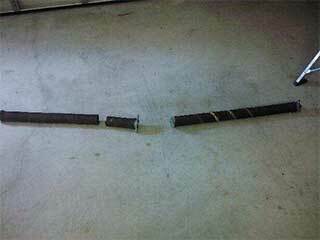 The last thing any garage door owner wants to have to deal with is a broken spring. Unfortunately, this is one of the most common malfunctions this type of system can suffer from. Handling this type of problem is dangerous, as the springs are the components that support and counterbalance the weight of the garage door panels, and as a result, they are a lot of tension and can cause a serious injury when they are mishandled. Although torsion springs are considered the "safer" of the two common types, they are still dangerous and must only be handled by experts. Usually, only a single unit is required, as springs of this type are quite strong and durable. They are installed horizontally above the door, across a steel shaft that's connected to cables that lift the door when their drum begins to rotate with the torque provided by the torsion spring. The nature of the operation of these components (twisting and unwinding) makes them less likely to go flying when they break, which is why they are often the preferred choice, provided that there is enough headroom space available to install them. Extension springs are installed in pairs, one on each side of the door. They are the older of the two types and are considered more dangerous. This is due to the fact that they stretch when the door lowers and contract when it needs to be opened again. Because of this, if one of them breaks, the second one is more than likely not far behind, so it will need to be replaced as well. Like we stated earlier, trying to perform spring replacement by yourself is a bad idea. The risk isn't over after a spring breaks. Your door could end up collapsing if you try to mess with while one of these components is in a compromised condition. It's always better to let professional technicians who are qualified and experienced to handle this type of dangerous scenario. Even if a simple spring adjustment is required in order to make sure your door continues opening evenly, this sort of task should not be attempted by an amateur. That's what our team is here for. If you want to make sure your springs are in a great condition, or if you need them to be replaced before they break, don't hesitate to contact our team at Garage Door Repair Kingwood right away. We'll make sure your door is safe to use again.